Saturday afternoon and we had some friends coming round for a BBQ later on, so I thought I’d make these for dessert. I had intended on making the Apricot & Almond Meringue Gateau, but my friend had already said she’d make a pavlova (naked) to be decorated with my strawberries, raspberries and redcurrants, so I thought it silly if we both made meringues. This is the last recipe from the ‘Tarts & Pastry’ section of the book, so it’s yet another section finished. I’m getting so close now to the end! It wasn’t the best day to be making pastry. The thermometer just outside the kitchen door was reading 32° already and the one inside was already at 27°. I should have put off making the Continental Cheesecake until now instead of earlier in the week! ether. At this point I removed it from the food processor and gave it a quick knead until it was smooth, which wasn’t very long at all. It was wrapped in clingfilm and popped into the fridge to rest for half an hour. After 30 minutes the oven was put on to preheat at Fan 170°C. The pastry was rolled out onto a lightly floured surface (underneath a sheet of clingfilm). It certainly didn’t like this heat. In all I cut out 10 7.5cm (3″) fluted rounds. Having re-rolled the trimmings only once. I don’t think the pastry would have coped with being rolled out any more, it was virtually melting in the heat! Mary says to ease the pastry rounds into patty tins, however, I had seen somewhere on Facebook that if you turn your patty tin upside down, you can put the rounds over the top of the mounds instead. This is meant to prevent ‘soggy bottoms’ so I thought I’d give it a go! The bottoms of the rounds were lightly pricked with a fork. I must admit it seemed a lot easier than lining and filling the pastry cases with baking beans! The cases were popped into the oven for about 15 minutes, after which time most of them were a lovely golden brown – a couple were slightly darker. I was pleased to see however that they were all intact, I did have visions of them falling off of their ‘mound’! They came off fairly easily and were left on a wire rack to cool. Mary says not to fill the cases until just before they were needed as they softened quickly. I did however prepare the cream (150g double cream whipped until it formed soft peaks). When the time arrived to fill the cases, I must admit I had probably had a little too much to drink and I had help from one of my friends, so they didn’t look really pretty – it was all rather rushed. I only just remembered to take a photo, and looking back I realise that I forgot to glaze the fruit. They should have been glazed with 4 tablespoons of warmed redcurrant jelly (if you are using red fruit) or apricot jam (if you are using orange or green fruit). I think I should have filled them before our guests arrived that evening, but In all honesty I wasn’t that impressed with them taste wise. I had already had a huge slice of my friend’s pavlova, so it may have been that the pavlova was incredibly sweet which probably didn’t allow me to appreciate their real flavour. They all went, so they must have been enjoyed. Would I make them again, I don’t think so, I think I preferred the ones I made the other day – Lemon Cream Tartlets (or Strawberry Shortcakes as I preferred to call them). 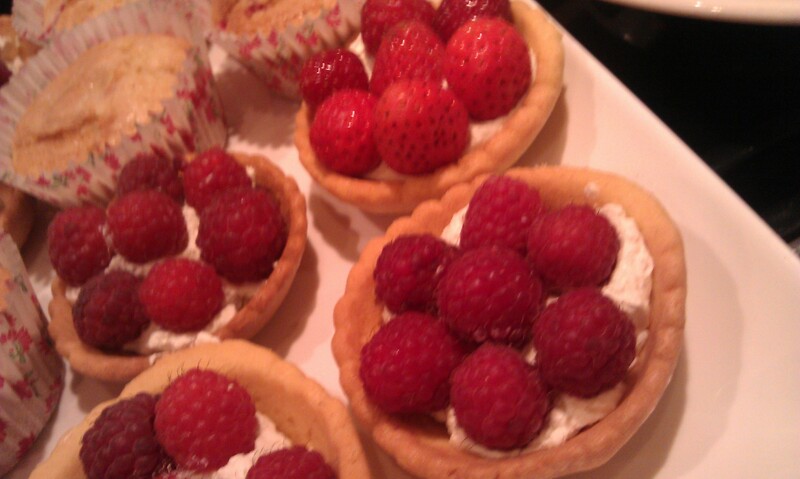 Again, apologies for the photo it was taken very quickly and before my friend messed about with the raspberries on top. Great fun was had by all at the BBQ anyway, so I forgive her!! !